On 17th, January 2018, Google Webmaster Central Blog has announced the Speed Update. Google confirms that speed has been used in ranking for some time, but starting in July 2018, page speed will be a ranking factor for mobile searches. On 15th, June 2015, The Android Soul Blog spotted the "Slow To Load" Warning. We don't know yet if it is a new test or an update of the Red Slow Label, but one thing is sure: you have to prepare your website for a major change! What is "Red Slow Label"? 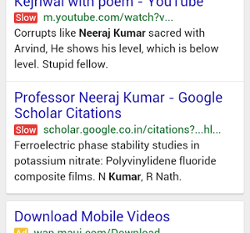 This page is about Google testing a new indicator in its mobile search results, the Red Slow Label, first spotted on 24th, February 2015 by K Neeraj Kayastha. This label would be a gamechanger as it warns the user before clicking that a website might load slowly. We don't know much of it right now, except that the label has been spotted using incognito mode (on android). Someone from Google when asked by Search Engine Land answered: "we're always experimenting"
If you're getting worried about your website speed due too Red Slow Label, please take a look on the other impacts: conversion rate, users satisfaction and confidence, hosting costs, average cart value, etc. A fast website is a must-have, not only for SEO!